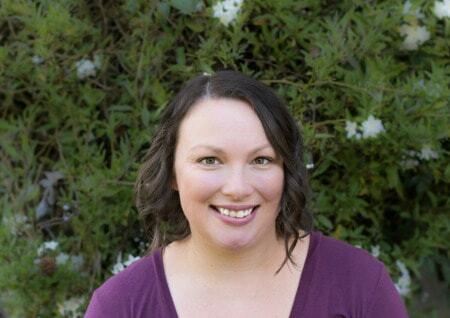 July 25, 2016 By Aileen 25 Comments This post contains affiliate links. As an Amazon Associate and member of other affiliate programs, I earn from qualifying purchases. 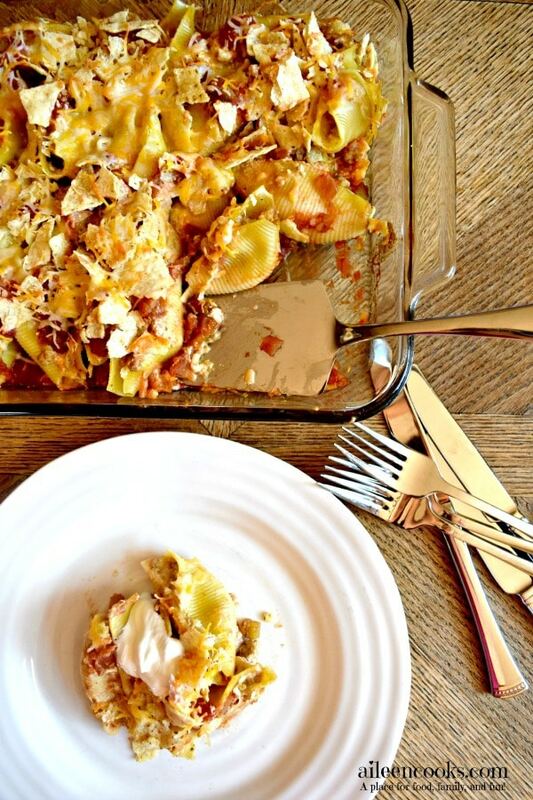 Taco stuffed shells are a fun spin on the classic stuffed shells recipe. It’s kid-friendly and freezer-friendly; a win-win in my book. This recipe calls for ground turkey, but ground beef can easily be substituted. I made a triple batch of this recipe as part of the 6 Weeks to Fill Your Freezer Challenge. We ate one batch and froze the other two. Start by spreading a casserole dish with salsa. 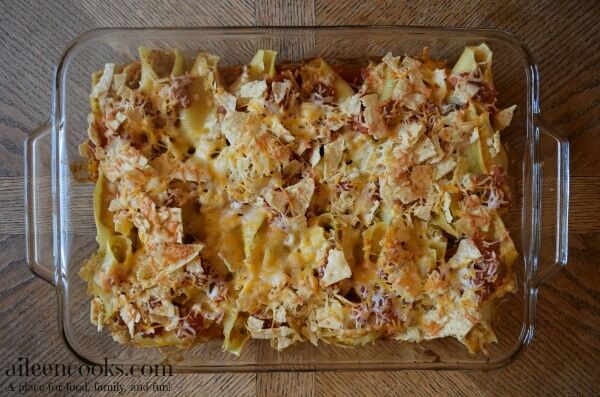 Add the taco stuffed shells. Sprinkle with tortilla chips (my kids’ favorite part). Finally, top it with cheese. Bake for 30 minutes and you’re left with a comforting and filling meal that will please your entire family. 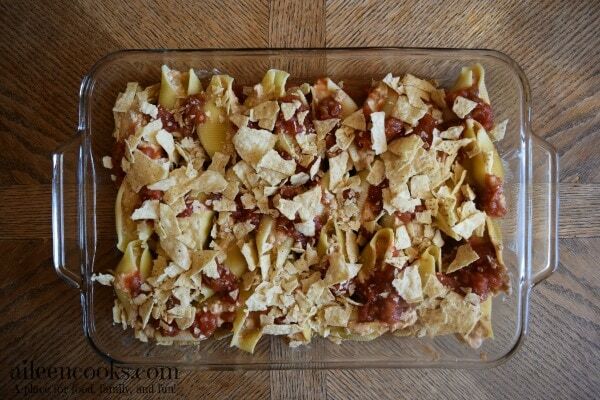 A delicious spin on classic stuffed shells with taco seasoning, beans, and cheese. Preheat your oven to 350 degrees. Lightly grease a 9x13 casserole dish and set aside. 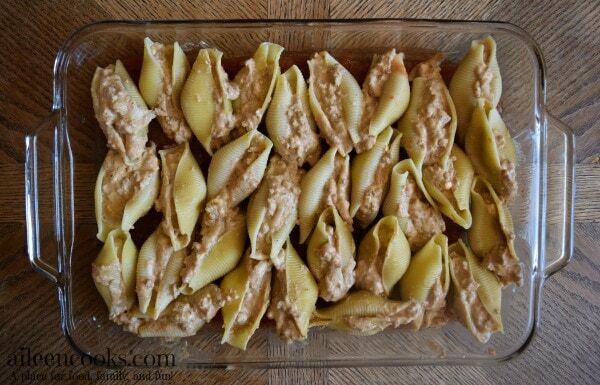 Once shells are done, drain and spread them out on a parchment lined cookie sheet to cool. Meanwhile, brown your ground turkey in a large skillet over medium high heat. Once brown, sprinkle the taco seasoning and water over the top of the meat and stir until combined. Let simmer for 5-7 minutes, until most of the liquid is absorbed. Mix in the refried beans and cream cheese. Turn off the heat. 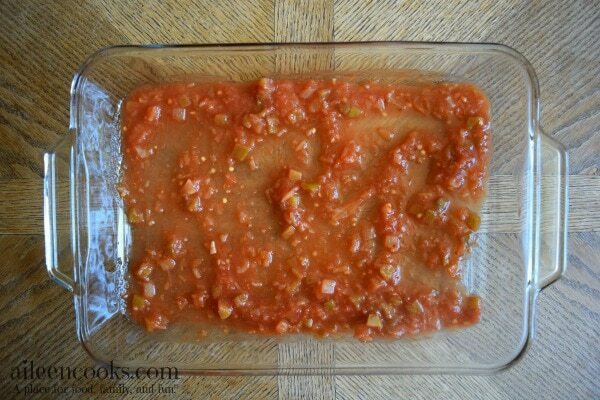 Spread 1 cup of the chunky salsa on the bottom of the casserole dish. 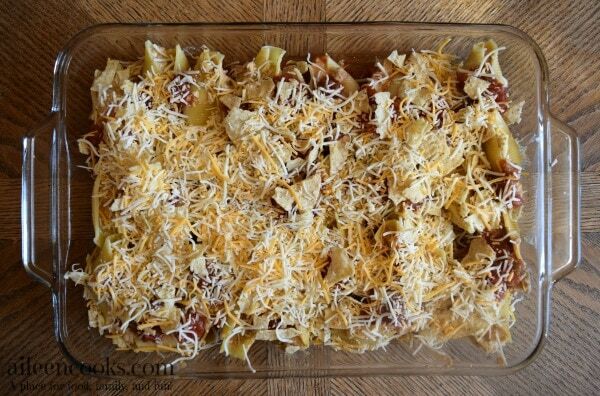 Fill each shell with the meat mixture and place opening side up in the casserole dish. Once all of the shells are filled and arranged, sprinkle the shells with the additional 1/2 cup salsa. 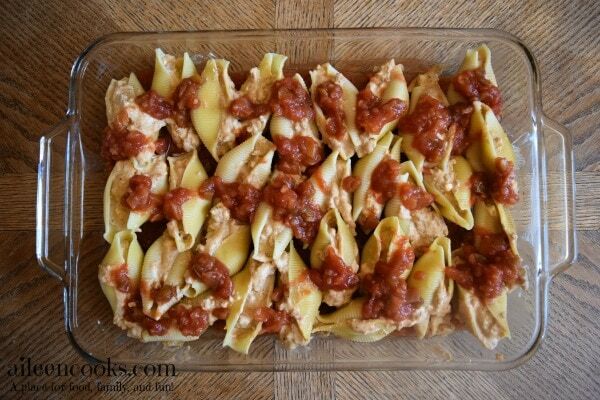 Top the salsa covered shells with the tortilla chips and then the cheese. Cover with foil and bake for 15 minutes. Remove foil and bake another 15 minutes. IF FREEZING: Cover with 2-3 layers of foil, label, and freeze. To Bake: defrost overnight in your fridge and add 10-15 minutes on your baking time. If baking from frozen, add 30-45 minutes, checking every 15 minutes. There is something about stuffed shells that kids love. Please let me know how this recipe works out for you! What a great twist on an old classic. Can’t wait to try these! oh these look delicious! I love anything with taco filling! 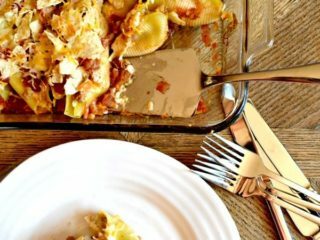 Stuffed shells are great and taco stuffed shells are better. Love you can freeze this. This looks and sounds delicious! Can’t wait to give this a try! I’ve had a friend try this before – not exactly the same but it was SOOOO delicious! These sound so tasty! What a fun and easy recipe! oh my gosh yum! I LOVE big shells and totally don’t cook with them enough! thanks for a great recipe! This looks like a fun dinner I could get my 8 year old to eat without complaining – great idea! I love tacos! 2 thumbs up for your delicious recipe! I can’t wait to try this. OK.. This looks so yummy!! I love tacos so much they are my favourite food beside sushi lol! Oh yum, this looks like my kind of recipe! I can’t wait to try this pasta recipe, thank you for sharing!! These look really good! I never really thought to make them any other way except Italian- will have to try! This seems right up my alley, I often triple recipes! YUM, those look so good. I really want to try those.